The first movie I'd like to discuss is Come Drink With Me. Made in 1966 by Shaw Brothers, under the direction of King Hu and starring Cheng Pei-pei, Come Drink With Me is one of the more important wuxia films (some say the most important) and an absolute pleasure to watch. 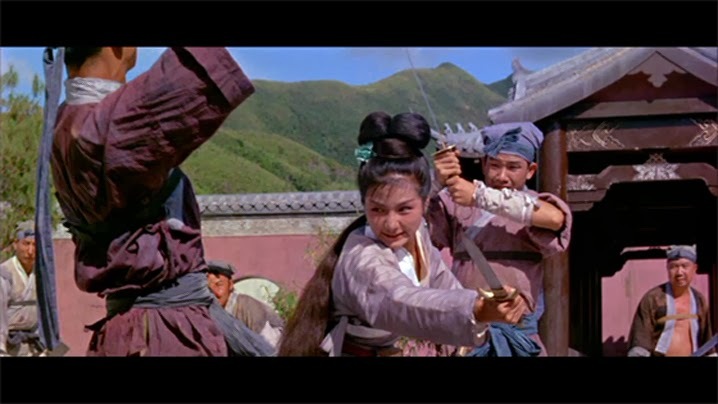 The storyline is quite simple, a group of bandits kidnap the son of a general during the Ming Dynasty and the general's daughter, Golden Swallow (played by Chen Pei-pei) goes to rescue her brother. In the process she is helped by a man named Drunken Cat, who turns out to be an expert martial artist hiding in the wake of his master's assassination by one of his senior students. With his assistance, she finds the hideout of the bandits who took her brother. The bandits are keeping him in a local Buddhist monastery and Golden Swallow goes there to investigate. There is more to the story than that (a lot more) but I don't want to give anything away for those who wish to see it. The first thing to know about the movie is for its time, it was quite bloody. 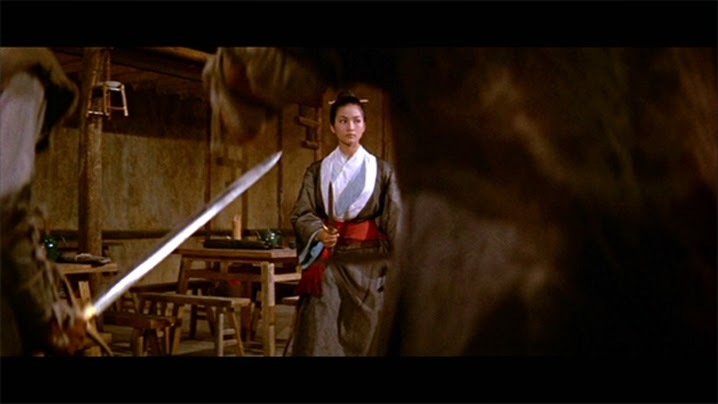 In the opening scene the sword play is punctuated with blood and dismemberment. The second thing to know is that King Hu wasn't striving for realism in his fight sequences. Cheng Pei-pei had a background in ballet and the fighting has a real dance-like quality to it. The original mandarin title of the movie translates roughly into Big Drunken Hero (I don't know a thing about Mandarin but this is mentioned on the Dragon Dynasty edition DVD). Here drunken hero refers to Drunken Cat, who is spends a good deal of screen time drinking wine from a gourd. But he is mainly a supporting character in the movie, a very important one, but not the star. The star is Cheng Pei-pei as Golden Swallow. Most readers probably recognize Cheng Pei-pei from her role as Jade Fox in Crouching Tiger, Hidden Dragon. She really carries Come Drink With Me and I highly recommend viewing her other movies if you have a chance (in particular Lady Hermit). Golden Swallow isn't just the daughter of a Ming general, she is well known, and widely feared martial hero. The fight scenes between the bandits and Golden Swallow are spectacular. By today's standards, they are perhaps a bit slow, but I think that is actually a good thing. There is more of a rhythm and flow to the movement, which makes it a little easier to watch and understand. And the dance-like nature of it really works. When I first saw it, after years of watching more recent martial arts movies, Come Drink With Me was genuinely refreshing. I was amazed by the fight choreography and performance. There is also a lot in here that is echoed in later movies. I am no film historian, so I am unclear on how much of it was innovation, but many of the standard features in Hong Kong and mainland China martial arts movies appear in Come Drink With Me. Still it was made in 1966, so some things do stand-out. One of the more interesting scenes, which I've seen a bit of in some of the other 60s-70s Shaws Brothers movies, is a musical section where Drunken Cat sings clues to Golden Swallow about the bandit hideout. It is nice because the singing actually fits in with the scene. Something I have heard about the movie is Jackie Chan appears in it as one of the young orphans following around Drunken Cat. I don't know if this is true or not, and have never been able to spot him myself. In an interview Cheng Pei-pei was asked about this and couldn't confirm it, saying she wasn't sure if he was in the movie or not. 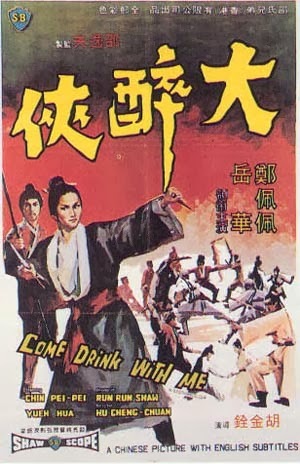 Definitely recommend Come Drink With Me to anyone with an interest in martial arts films, and a must if you are into Wuxia specifically. It has a great leading actress, and three of the best villains I've ever encountered. If you like it, there is a follow-up called Golden Swallow, though it wasn't directed by King Hu. I would strongly recommend that as well (if only for the absolutely insane final battle in the end) but think Lady Hermit and The Shadow Whip are better options if you want to see some additional Cheng Pei-pei films. Great material Lee. The Condor Heroes trilogy was a huge influence on Ogre Gate (mainly the television series). Love the stuff you have there. very good review, I look forward to reading more of them from you. Thanks. This is one of my favorite movies.